JERUSALEM (CNN) -- The parents of captured Israeli soldier Gilad Shalit set up camp Sunday outside the residence of Israeli Prime Minister Ehud Olmert in hopes of pressuring government officials to a secure a deal with Hamas that would bring their son home. 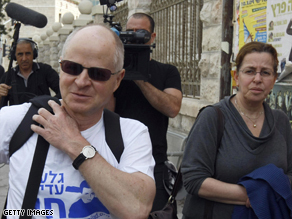 Noam Shalit, left, and wife Aviva arrive Sunday to camp outside the Israeli prime minister's Jerusalem home. Noam and Aviva Shalit took up residence in a tent across from the outgoing Prime Minister's office, vowing to stay there until Olmert completes his term. "We demand that this government will conclude the crisis and will bring back Gilad before it finishes the term," Noam Shalit told CNN. Gilad Shalit was 19 when he was captured in June 2006 by Palestinian militants from Gaza, including some linked to Hamas. The militants tunneled into Israel and attacked an Israeli army outpost near the Gaza-Israel-Egypt border, killing two other soldiers in the assault. Hamas, which won parliamentary elections in 2006, is demanding the release of hundreds of Palestinian prisoners in Israel in exchange for Shalit. Israel has refused to release the prisoners, many of whom were convicted of committing terrorist attacks against Israeli citizens. Israel is demanding Hamas release Shalit before it fully reopens border crossings with Gaza, which were closed during Israel's three-week military campaign in the region triggered by Hamas rocket attacks into Israel. Hamas has rejected the release of Shalit as part of a cease-fire negotiation with Israel.